My apprenticeship as a Geisha or Geiko, specific to Kyoto. During our honeymoon we traveled throughout Japan and the Philippines for 3 weeks with only carryons. See below some of the essentials I packed! I'm excited to share with you my tips and tricks for staying fit and healthy while traveling. My husband and I travel a lot, both as a personal priority to see and experience the world as well as for business. We typically pick destinations based on accessibility, direct or relatively direct flights, climate, food and whether or not either of us has been before. Traveling can be exhilarating and inspiring, as much as it can be draining and challenging. So how do we make the most of our trips and experiences, as to ensure we can enjoy every moment and return refreshed and energized rather than exhausted and depleted? Check out my tips and tricks below to help make the most of your trips, to avoid jet lag and to return better than when you left! Cheers to happy and healthy traveling! TIP #1: Supplement up! When traveling around the world and trying new foods, regardless of your diet or preferences, our stomachs can also experience some form of culture shot. I rely on these two supplements as an important way to keep my gut happy and digestive system regular: (1) Travel-safe Renew Life Ultimate Flora probiotic, the Go Packs do not require refrigeration, and (2) Natural Calm's magnesium powder packs, which I usually mix into a bottle of water in the morning or night before bedtime. After recently traveling throughout India, the Middle East and Asia, I had little to no digestive issues or disruptions and attribute the consistency to both constant hydration and these 2 supplements. I also always travel with a small emergency kit just in case the water, food or other sneaky bacterias get the best of us, which includes Pepto-Bismol, Imodiun, Benadryl, Melatonin supplements, Ibuprofen and Acetaminophen, which is gentler on the stomach if you have aches/pains but are taking on a sour or empty stomach. TIP #2: You gotta have balls [and bands]! Flights, particularly the 14+-hour long hauls, can be incredibly taxing on the body. To avoid that I pay close attention to hydration and try to avoid alcohol before and during flights, or will limit to one small glass of wine, and drink an absurd amount of water. I usually chug a liter at the airport before the flight and subsequently stock up on several bottles throughout the flight. I also pack some compact exercise equipment in my carryon, along with all my necessary supplements and toiletries, to make movement easier no matter the size of my seat or duration of the flight. (1) These massage balls are awesome to put behind your back while seated on the plane, under your feet or against a wall if you luck out in the bulk head or on a spacious aircraft. They are also great once you get to your destination, as they're far easier to pack than a foam roller but provide the same myofascial release, particularly for lower back, shoulder, leg, hip and foot discomfort or tension. And one is enough to be effective, if two seems like too much to pack. (2) These exercise bands are great to pull up to your ankles, calves, thighs, or even over your wrists or forearms to do some light resistant work while you sit in your seat, wait in line for the bathroom or roam the aisles. They are compact, versatile and not totally embarrassing to break out in public. Though, in order to be consciously and intentionally fit and healthy, you will have to get over any potential embarrassment of standing out. You will stand out and that's a good thing! Be the model you wish to see in this world, not the mirror! TIP #3: Sleeping beauty necessities! Planes are noisy, usually have stale air, inconsistent temperatures and mediocre food. So to combat a few of these annoyances, I rely on the following to keep me sleeping soundly, my skin hydrated, and the disruptions few and far between. (1) Invest in a comfortable and quality eye mask that fits your face and head comfortably, while also doesn't let light in or put too much pressure on your nose or eyelids. I prefer these two: Master Sleep Mask and Brookstone's sleep mask, as they are truly black-out and sit comfortably on my face. However, similar to glasses, you may need to try a few before landing on what "frame" fits your face and needs best. For instance, my husband sleeps on planes with headphones, so the Master Sleep Mask doesn't work for him since there is side cushioning, but for me it slides perfectly over my ear plugs. 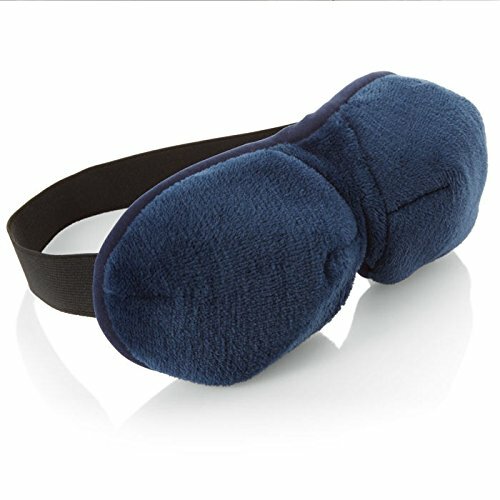 I'd also like to reiterate that in order to optimize your health and fitness while traveling, and generally in life, you have to throw away any self-consciousness you may have about wearing this absurd bug eye mask in public, doing stretches or exercises on a plane, or even vocalizing your comfort or food needs to flight attendants, waitresses or whomever you encounter. It's about your comfort, happiness and ultimately your health, not how someone else perceives you. Aside from drinking tons of water, I am also conscious of my skin staying hydrated and always carry on (2) coconut oil packs to use as make-up remover and moisturizer, (3) Aquaphor to put around my nose so I don't dry out while I sleep, (4) lubricating eye drops for when I wake up, and a (5) hydrating face mist of some kind (this or this does the trick for me). To help eliminate noise, I'd also invest in some noise-canceling headphones, and although my husband can sleep with them on as mentioned, I prefer some good old-fashioned ear plugs while sleeping. (6) These are my favorite, as they don't hurt my eardrums after wearing for an extended time but still manage to block out most noises. I also love to leverage the fact that planes always have hot water, usually, so I bring along a few packs of my favorite herbal or sleepy time tea to encourage a peaceful and pleasant experience as I drift off. (4) Yogi soothing bedtime and Organic India Tulsi wellness sleep tea are my current go-tos. TIP #4: Get in the zone, the time zone! I set my watch/computer to the time zone of our final destination to adjust asap. If it's nighttime where we're headed, I'll ask the flight attendant if they're willing to expedite my meal service in order to get ready for bed as soon as possible. Conversely, if it's morning where we're headed, I'll force myself to stay up for the duration of the flight and that way when we land, I'll sleep soundly as bedtime quickly approaches (though this usually results in a quick plane power nap for me, which always worries my husband). TIP #5: Comfort is key! I always wear comfortable, flexible and breathable layers for long flights, and make sure to bring disposable hotel slippers to slip on when walking around or going to the bathroom. There are so many companies that are catering to transitional clothing and Lululemon has mastered, in my opinion, the art of being compact, versatile and stylish. I love their Madala wrap, which can be used as a cape, blanket, scarf or even rolled into a pillow, it also doesn't wrinkle and acts as a great in-between jacket for cooler nights in otherwise warm places. My husband usually wears the same thing every time he flies, which is a Lulu Metal Vent Tech shirt and the original Surge sweat pant, which seems to be closest to the Rise n' Sweat pant now since they sold out of the original Surge pant. You do you though, whatever you're most comfortable in for the flight and will easily transition you from ground to air and to new ground again, works just fine. It doesn't have to be fancy just functional for you and your needs! TIP #6: Get your stretch on! Keeping the blood moving while in-flight it imperative, while you're not sleeping to adjust to your new timezone, but stretching can also help when you arrive to your destination and back home again. Check out these easy poses from The Chopra Center to incorporate into your travel routine to help bring your body back to life and avoid jet lag. Viparita Karani or Legs Up the Wall is my favorite. Try them out to find your go-to! TIP #7: To eat or not to eat plane food?! Depending on your food preferences or restrictions, make sure you've updated your airline profile to be gluten-free, vegetarian or whatever you're needing. If they offer special meals on the flight, it's nice to have the option to eat something your stomach can handle. So, make it a habit that when you select your seat to also select your meal preference, if it's an option. International flights usually have a better selection, but come prepared as to avoid getting hangry or indulging in something your skin or stomach may regret later! Bring (1) homemade trail mix (my current mix in the pantry includes: raw cashews, pecans, macadamia nuts, brazil nuts, cocoa nibs, dried unsweetened coconut shreds and some seeds), (2) RXBAR or Epic bars (or a healthy, natural, low-sugar bar of your choice), (3) natural nut butter packets (like Artisana, as the only ingredient is the organic raw nuts), and (4) some raw veggies or whole fruit that won't get wilted or yucky in flight. I hope you've found these tips helpful and would love to hear from you all on how you stay fresh, healthy and fit while traveling! Please comment below or send me a message. I would love to further optimize our travel experience and absolutely love interacting with you all! Thanks again and hope you have a magical and energizing day! New Blog Inspiration...Fitness Class Reviews and My First Review!